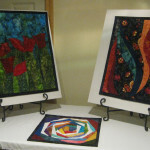 On Friday, November 6th I am participating for the 4th year in the Lewisburg PA Stroll Through the Arts. It is a fun short show in which about 30 artists se t up some of their art in different businesses in downtown Lewisburg. From 6pm – 10pm the public can wander through while shopping or perhaps just to see the art and artists. It is different from a festival in which you have a 10′ x 10′ tent and much more space. My space inside the Mercantile store at 319 Market Street in Lewisburg has been an excellent location for me. This merchant has a very popular store with unique house and gift items. 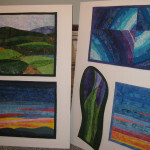 My unique, contemporary quilts fit just fine! 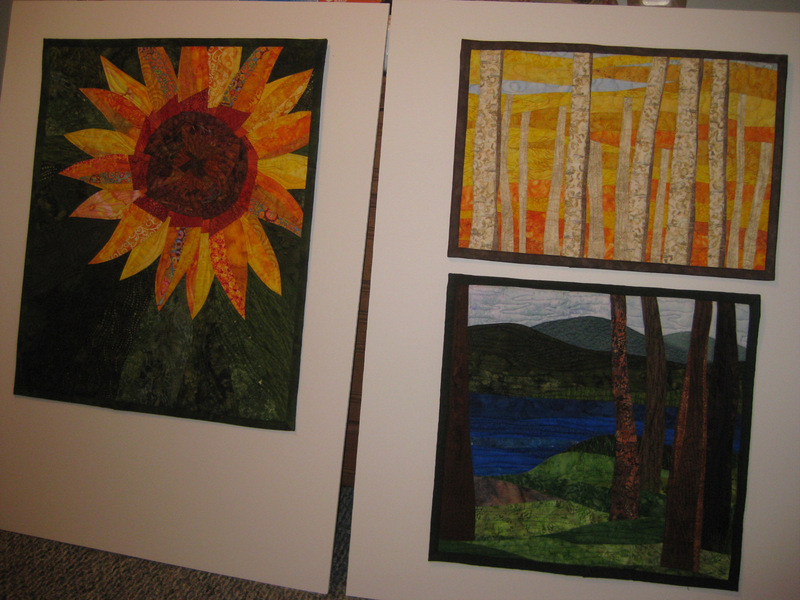 But…my space is about 6′ x 6′ with no wall space, a bit of a challenge for wall quilts! I have solved this problem with the use of a table and table top displays and lots of white boards which the store owner lets me lean against some lower shelves for the evening. 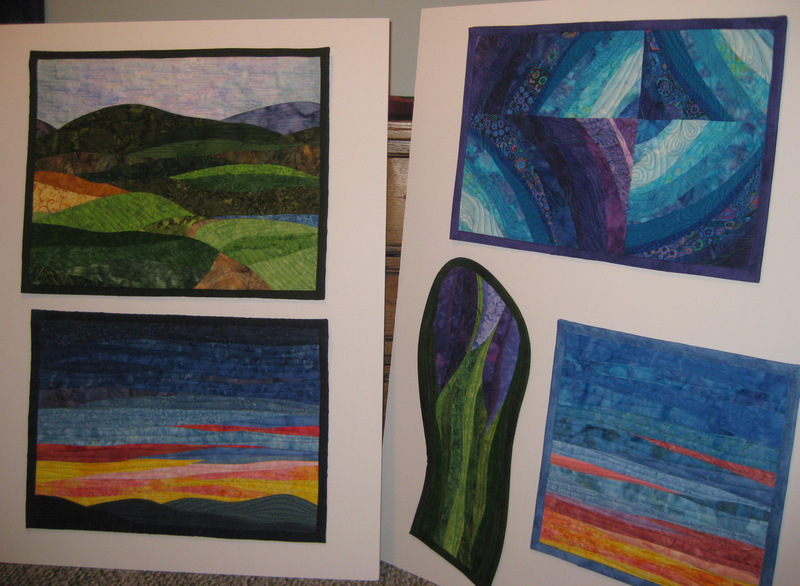 I am able to fit my small folding table so, again with smaller white boards and some table top easels, I can display my smallest quilts on top of the table. This is a great venue for people doing early holiday shopping. 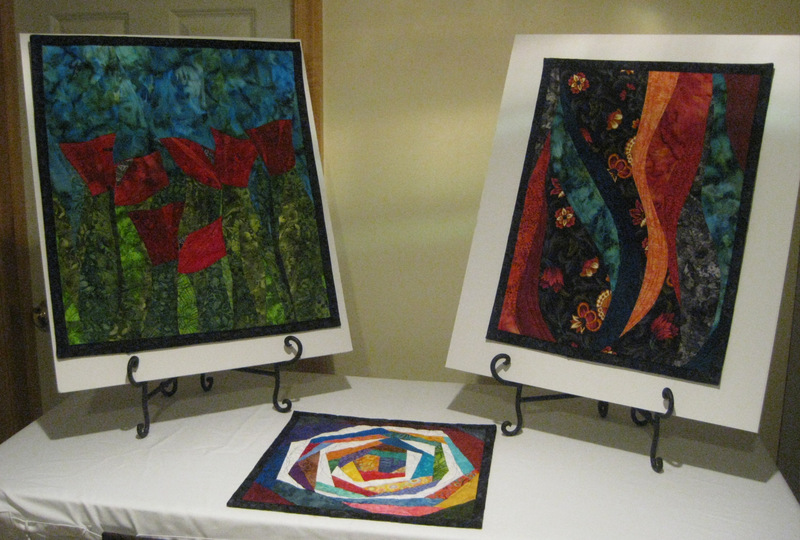 A focus on smaller quilts works for the space available and for the customer preferences for an event such as this. If you live in central Pennsylvania, come to the Stroll on November 6th. Merchants have refreshments (and some even have wine!). There are luminaries on the sidewalk outside of the merchants with artists inside. Our weather has ranged from the mild Indian summer temperatures with doors open to some chilly nights so dress accordingly. It is a fun night and a chance to meet about 30 local artists!